Believe it or not, there are times when youth sports really are all about the kids, playing now, at this moment. Not about parents, coaches, future scholarships, future pro careers, who’s on the travel team, or who’s bringing the snack. All of a sudden, a game gets so good and compelling, and the young players’ nerves of steel so awe-inspiring, that all you can do is watch and enjoy the ride. 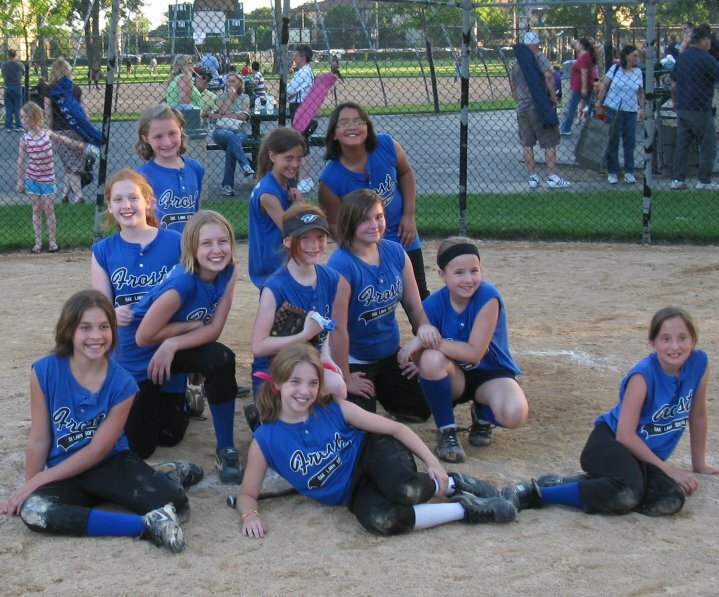 Tonight, that was my 10-year-old daughter’s third-place softball game for in the kinda-sexist-named Petite Division of the Oak Lawn, Ill., house softball program. Usually, a third-place game (I managed that same daughter in one two years ago) is a loose affair, what with the pressure of a championship gone. (Thank God.) My daughter Grace’s team is pretty loose to begin with, so they can practically barely stand erect as her Frost, the fourth-place team in the regular season, played the Storm, the second-place team. The Frost went up 2-0 in the top of the first inning, and the Storm tied it in the bottom of the second. The bottom of the third wasn’t so good for the Frost. They gave up the maximum six runs in an inning, were down 8-2, and looked outmatched by a team that had four travel players to their one. The girls looked dispirited coming into the dugout — and didn’t look any better when they went down 1-2 in the top of the fourth. The coaches’ voices didn’t change pitch, but the Frost coaches seemed much louder as they urged their players. But then, the magic started happening. The Frost scored four runs in the bottom of that inning, the last two, if I may brag, on a two-run opposite-field single by Grace. Now down only 8-6, the Frost’s spirits were back up, and the parents started getting a little more interested in the game. A few by me joked about not wanting to go to the bathroom, lest they miss anything. All that toilet talk made me have to use the bathroom (where, by the way, I was saw my daughter’s manager in the next stall). Actually, not just the parents were zooming in their focus. This Frost-Storm game was taking long enough, games were finishing on other fields, and hearing about the comeback under way, players and their families decided to stick around and watch. Slowly more people were circling the field, cheering good plays (by either team), and making more of a buzz and ruckus than your average Florida Marlins home game. I don’t know much about the Storm. But what they were seeing out of the Frost was pure guts. Players who normally didn’t hit were smacking balls. The Frost would get pushed to the edge of the abyss, then come fighting back. Again in the bottom of the fifth, the Frost got two quick outs. But then came four more runs — on two-run singles placed to about the same spot Grace placed hers. By the end of five-and-half innings, a 8-2 Frost deficit had become a 10-10 tie. More fans streamed toward the field, out of the impending darkness, to check out what was going on. What was going on was two teams of 9- to freshly minted 11-year-old girls who were as cool and loose as the crowd was wound tight, especially we parents. It’s always difficult to watch your child play because you can’t protect them from injury or failure. It’s even harder when they are being put in situations that would make major-leaguers fold. In the Frost’s comeback, all of the eight runs they scored after falling behind came with two outs. A lot of them came with two strikes. I don’t think they even heard the parents or coaches anymore. I didn’t. I didn’t know of anything that wasn’t happening in front of me. The Storm came back with one run in the bottom of the fifth to go up 11-10. That meant, for the Frost, score in the top of the sixth, or the game is over. Grace strikes out to start 6th. Just setting team up for more two-out heroics. Hey, after what I had seen the previous two innings, that was not a cocky thing to say. Meanwhile, the players and coaches for the Petite championship game, which was already supposed to have started, were now gathering around to watch. It turns out the heroics were after one out. More girls smacked base hits to that same magic spot in right field, and the Frost ended the top of the sixth up 13-11. Do you believe in miracles? The Storm didn’t become a second-place team by folding up easily, either. Though they appeared rattled at times that the Frost wouldn’t go away, they rallied for two runs in the bottom of the sixth and final regulation inning. They had the bases loaded with two out. One walk, and the game was over. The Frost’s pitcher, Jackie, who in her first game pitching cried herself to distraction after her rough outing (so much I had Grace make a point to tell her everything was OK and her teammates had her back), was now in her third inning tonight — and she wasn’t backing down. Sure, she might get a little frustrated over a bad pitch, but her eyes were lasers into the catcher’s glove. The count works to two balls and two strikes. At this point, the 15,000 people were standing or on the literal edges of their seats to see what would happen. Discussion over how a 10-year-old girl can stomach this much pressure was rampant. If anybody brought Maalox, they were chugging it. Jackie throws a pitch catching the outside part of the plate. Called strike three. Game is tied. You know the cliche that it’s a shame somebody has to lose this game? (Ask John Isner and Nicolas Mahut about that one.) As it turned out, in Frost v. Storm for third place, no one had to. It was 8:35 p.m., 35 minutes after the championship game was supposed to have started. So no extra innings — there’s a tie for third. For this game, there really was no other appropriate way to end it. I don’t know how the Storm felt. But the Frost players were beaming and jumping around with excitement over grinding out such a tough, um, not-win. After each game in their league, a team will form a line with players on each side, slapping hands and chanting, “We. Are. Proud of you, yeah, we are proud of you,” as the other team runs underneath — and then the teams reverse the lineup. In this case, I think the 27,000 fans who saw the end were ready to do the same chant with each team. Oh, of course, there were some dimbulbs who couldn’t grasp the excitement of the moment. One old fart sitting next to me was ripping the coaches and the players like he was watching a Chicago White Sox game. Dude, these are volunteers coaches and 10-year-old girls, not full-time millionaire pros. Another guy was upset the Frost and Storm couldn’t play extra innings. I mean, really whining about it. Another parent mentioned to Grace’s coach that it’s too bad the Frost made so many errors, or they would have won. My response is to quote my late father: If my aunt had balls, she’d be my uncle. Who cares? Each team makes errors. Half the fun of watching this age group play is seeing how they recover from their mistakes — and both teams improved by leaps and bounds in learning how to forget their mistakes and move on. It’s nearly three hours after the Frost-Storm game, and I’m still feeling a buzz about it. It’s the kind of buzz that keeps me excited about my kids’ games, even when around me there’s hassles with parents, coaches, future scholarships, future pro careers, who’s on the travel team, and who’s bringing the snack. Your 2010 Frost, after losing to the eventual champion. Yep, they’re a loose group.